Great British movies and the best of the BBC, along with classic American TV and mini-series! The Video Collection catalog hand picks the best of British and American cinema (past and present), along with superior television programming, documentaries, mini series and more! British Comedy - Who needs crass gags and gross-out humor when you have wit and word-play in your favor? From staples ranging from Monty Python and Mr. Bean to Doc Martin and As Time Goes By, you'll get the full flavor of the U.K.'s best comic talents on DVD and Blu-ray. Comedy has no age limit with great BBC shows such as Last of the Summer Wine and Last Tango in Halifax. Plus there are other great amusements in store with Absolutely Fabulous, Are You Being Served?, Jeeves & Wooster and Black Adder. British Drama - Since the birth of William Shakespeare, the British have been at the forefront of high-quality drama as entertainment. From the Old Globe Theatre to DVD and Blu-ray, you will be impressed by the dramatic arts in Downton Abbey, Poldark, The Durrells of Corfu, Love & Friendship, The Dressmaker, Victoria and more. British Mysteries - There's something about being stuck on such a dreary island that seems to incite murder, and the BBC delivers some of the U.K.'s best mystery series on DVD and Blu-ray. In fact, it is elementary to love Sherlock Holmes, Father Brown, Inspector Lewis, Midsomer Murders, Agatha Christie's Poirot, and many other British mysteries. American TV - Not all brilliant TV is British. The bloody Yanks put forth intelligent programming when no one else is looking. 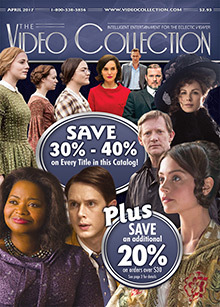 That's why The Video Collection also sells DVDs and Blu-ray discs filled with incredible shows and mini-series such as Jesse Stone, The Carol Burnett Show, The Winds of War, Shogun, Roots, Magnum P.I., Cheers, Frasier, Perry Mason, Longmire and more. Your valuable Video Collection coupon code makes completing your personal collection of exciting British film and TV series easy on your entertainment budget.